Test Django XML-RPC views using the Django test client. Because you’re using the Django test client, you’re not actually sending HTTP requests and don’t need a server running. You also can check the latest Travis CI results, but Travis doesn’t build all of the above platforms. Prerequisite: Which Python are you going to use? I’m going to briefly cover this, because getting Python installed on your OS of choice could be a blog post in itself. Are you going to use the system Python? This is easiest if your OS has a recent enough version that you want to use. Mine, CentOS 5.5, in this case comes with Python 2.4.3, which is pretty long in the tooth, so I wouldn’t bother with it. Even if it was a modern Python, I tend to shy away from doing much with the system Python, because it’s the system python, and I don’t want to do things and break my system. You might be OK with using a virtualenv of your system Python to get some isolation or you might do like I did in this case and simply install a fresh new version of Python with no connection whatsoever to the system Python. In fact, I installed a new Python and created a virtualenv in it specifically for the Django stuff I was doing. I needed the LD_RUN_PATH stuff so that mod_wsgi.so could link with /usr/local/lib/libpython2.7.so.1.0 at runtime. This installed mod_wsgi.so as /usr/lib64/httpd/modules/mod_wsgi.so (which is also available at /etc/httpd/modules/mod_wsgi.so because I already had a symlink from /etc/httpd/modules to /usr/lib64/httpd/modules. I did a bunch of searching and found posts of people having similar troubles but I didn’t find an answer. I wonder if mod_wsgi could be modified to detect the presence of mod_python and if it finds it, blast the logs with warnings? Frankly, I don’t know enough about Apache modules to know if this is possible. This of course will have to be heavily customized depending on whether you’re using a virtualenv and where it is and where your app is located, etc. Make sure directories are writable by Apache, etc. If you set up everything initially as your own user and then moved it over to mod_wsgi, then you might have files that belong to your user and which are not writable by Apache. Log directories, SQLite databases, directories for uploaded files (typically called “media” in Django paralance), etc. The Django runserver makes things easy by serving static files for you. Django when deployed via mod_wsgi won’t serve static files by default. There are probably hacks to make it do that, but if you’re already running Apache it makes more sense to just have Apache serve those static files. That is certainly what the Django guys encourage. I set the MEDIA_ROOT and MEDIA_URL settings in settings.py and then did some symlinking and Apache configuration so that Apache could serve the files out of /www/python/media. And I created a directory /www/python/static for stuff like CSS and JS files and collected them from the apps into this directory using python manage.py collectstatic. At this point, I had done a lot of hacking and got it mostly working. The one missing piece was that I could not upload packages to my custom PyPI server (i.e. : with python setup.py register -r chegg sdist upload -r chegg). Actually it worked when I had my ~/.pypirc pointed to the Django runserver; it just didn’t work with the mod_wsgi version — it failed with Upload failed (401): UNAUTHORIZED. This took a while to figure out, but I eventually found the reason and answer here. Basically this is because djangopypi does checking of the HTTP Authorization header in order to see if you’re authorized, and mod_wsgi by default filters out this header as a security precaution, on the assumption that you would let Apache do the authorization check and not involve the WSGI apps in this. I imagine that this is something useful for providers of shared web hosting, but it obviously will not work if you have WSGI apps doing their own authorization, as I had in this case with djangopypi. The answer was to turn on WSGIPassAuthorization by adding WSGIPassAuthorization On to my Apache vhost config. So now it’s working although it took annoyingly long to set up. Take some time out from the daily grind and discuss the issue until consensus is reached and a decision is made (and hopefully documented!) for how to handle stuff going forward. I know which one I prefer. How about you…? I’ve been using Carbonite for a while and it’s worked well most of this time (though how do you know if a backup tool is working? ), but recently I’ve started to notice a few issues with it and I may end up switching to another cloud backup service (I’m currently evaluating CrashPlan and another part of me is seriously considering going old-school and using good ol’ rsync or maybe just cloning to a bunch of spare hard drives and then leaving them with friends and family). Some if these issues might not be serious, but when it comes to a backup tool, it makes me nervous when I see weird unexplainable behavior. I like my backup software to just work. And that is why I’m detailing everything weird I saw, even if some of it is the inevitable stuff that you get when you peek too closely into the sausage factory. A couple of weeks ago, I noticed that Carbonite had been “stuck” – there were about 1500 files that were pending backup and that number was not shrinking. I happened to notice this because we had taken a lot of photos and I decided to check whether they were getting backed up. If I had not checked and our hard drive crashed, that could’ve been really bad. This stuck backup lead to me spending quite a few hours measuring, diagnosing, disk repairing, and tweaking and it looks like things are working better now (I have only 42 files pending backup now). It also lead to the discovery of other issues that are detailed below. But the main point I want to make here is that I should not have to notice that backups have stalled. Carbonite should detect that it is not progressing and send me an alert email and/or popup on my screen. This is possibly one of the big reasons for the Issue 1. When my backup wasn’t progressing, I looked for clues by looking at /Library/Application Support/Carbonite/Data/Carbonite.log and noticed that CPU Idle was almost never at the CPU Idle target of 75%. I’m wondering if this is causing Carbonite to not back up? I tried quitting every program on my computer (including all sorts of menu bar apps and background apps such as Cloud.app, Dropbox, Evernote, Jenkins, etc). The only thing that is using a lot of CPU, according to Activity Monitor, is Carbonite itself. At this point, I started looking at what Carbonite was looking at using the fs_usage command. Ideally, I shouldn’t have to quit every program on my computer in order to get the CPU usage low enough for Carbonite to be able to do backups. The beauty of a cloud backup app like Carbonite is that it just should just do its thing in the background without me having to change my workflow. When it’s working well, this is how it works. I’m not sure of why it has been stumbling lately. 1346811842  @ 2954915840: Backup progress: completed 38%, file counts last 2 22:10:34 All: 3617 (1081M bytes) Unique: 3225 (731M bytes), Compressed: 848M bytes. 1346811842  @ 2954915840: Backup progress: remaining time unknown, file counts All: 563085 (217G bytes), Pending: 1396 (1767M bytes). This does not inspire confidence. 1347897240  # 2956513280: Delaying backup due to zero length file modified within the last minute: "/Volumes/Momentus/Users/marc/Library/Preferences/MaxBack .mxbk". 1347897240  # 2956513280: Delaying backup due to zero length file modified within the last minute: "/Volumes/Momentus/Users/marc/Dropbox/Camera Uploads/Icon ". 1347897240  # 2956513280: Delaying backup due to zero length file modified within the last minute: "/Volumes/Momentus/Users/marc/Library/Application Support/Evernote/accounts/Evernote/msabramo/note.index/write.lock". 1347897240  # 2956513280: Delaying backup due to zero length file modified within the last minute: "/Volumes/Momentus/Users/marc/Library/Application Support/Google/Chrome/Default/Extension State/LOCK". But the apps that write these files are not running and these files have not been modified recently at all. $ ls -l "/Volumes/Momentus/Users/marc/Library/Preferences/MaxBack .mxbk"
$ ls -l "/Volumes/Momentus/Users/marc/Dropbox/Camera Uploads/Icon^M"
-rw-r--r--@ 1 marc  marc  0 Sep 10 23:28 /Volumes/Momentus/Users/marc/Dropbox/Camera Uploads/Icon? $ ls -l "/Volumes/Momentus/Users/marc/Library/Application Support/Evernote/accounts/Evernote/msabramo/note.index/write.lock"
$ ls -l "/Volumes/Momentus/Users/marc/Library/Application Support/Google/Chrome/Default/Extension State/LOCK"
This may or may not be affecting my backup appreciably, but the issue here is that when I’ve already had some difficulty getting Carbonite to do its backups, then when I look through the logs and notice other thing that seem incorrect, it further erodes my confidence in the product. Carbonite doesn’t log every single file it looks at (Thank goodness! That would be extremely inefficient. ), so most folks wouldn’t even notice this one. I only did because my backup was not progressing and I kept seeing messages in the logs saying that Carbonite was waiting because CPU usage was too high, and Carbonite was the only app using a lot of CPU, so I went poking around to see what it was so busy doing. I cut this off at 3 entries, but in reality, I saw this 44 times in one second (and it happened for more than one second, but I stopped counting). This also isn’t the only directory that it’s continuing to check – there are several others. The fact that an app is repeatedly accessing the same file over and over 44 times per second is concerning in itself. To add fuel to the fire, this directory no longer exists! See, I noticed this message many times in the past and I thought that I could give Carbonite a hand and get it past its compulsive checking by deleting this directory and a bunch of other ones that it was compulsively checking. So maybe a week ago, I went on a rampage and blew away a bunch of directories that Carbonite was obsesssing over that weren’t important to me. Problem is, Carbonite is still checking them! And this is even after I uninstalled Carbonite, blew away all its preferences and support files, rebooted, and reinstalled Carbonite. Either I missed deleting the file on my local filesystem that carries this state, or, more likely, the knowledge of this file is in Carbonite’s servers. Perhaps after some amount of time or some number of failed attempts to access the file (how many? ), Carbonite will forget about these files. But in the meantime, I worry that it’s wasting its time checking stuff that’s gone and it could be better spending its time backing up the files that I do have. I’ve accumulated the info in this post over the course of the last several weeks. At one point, I did a bunch of fiddling including a disk repair on my startup disk and managed to get Carbonite to make a bunch of progress so that only 70 or so files were pending backup (it’s quite possible that disk errors were confusing Carbonite). Still I wanted them all to be backed up or at least know which files those were that were not being backed up and why. The latest is that I talked to Carbonite support and had a fairly nice and helpful guy connect to my machine remotely and make Carbonite exclude some files that are supposedly problematic (browser caches and the like) and mess around with some Carbonite caches. This didn’t really make Carbonite catch up and back up the remaining 70 files. In fact, over the course of the last few days that number has grown to a little over 300. This suggests to me that Carbonite is having trouble with some of these files and is “stuck” and will likely fall further and further behind but I don’t know which files are the problematic ones and Carbonite support hasn’t yet been able to tell me which files these are. Hard to know whether it’s working – how do I really know which files the provider has and which they don’t? Cloud backup uses a ton of my computer CPU and Internet and network bandwidth for months and months. When I do do backups myself, I kick it off and after a few hours it’s done. When the time comes to restore files, I will have to download a tremendous amount of data or pay over a hundred dollars for them to ship me a hard drive. Even then, the hard drive or files downloaded will just be files; not a bootable image. Conversely if I go to a friend’s house and pick up a hard drive with a clone of my system, I have all of my files fast and I have something I can boot off of. I could save the money on the subscription fee and use it towards my hard drive budget. What is up with Mail.app and Exchange? Fired up Mail.app on my work laptop today for the first time in a while. Outlook 2011, OWA (the Outlook Web interface) and my iPhone all show the same state of my inbox, with a single message in it. Mail.app shows two messages – the one that the other guys show and one that I filed many hours ago. Quitting Mail.app, moving my ~/Library/Mail folder to somewhere else, Start Mail.app, go through the wizard to see up my Exchange account all over again. Nope. Still shows those blasted two messages. The last one is rather amazing to me. If I moved the folder out of the way, that seems to me like it would be pretty much starting from scratch. If that didn’t work, I can only guess that either the OS is doing some caching that I don’t know about or the message is still on the server and Mail.app is just interpreting the server state didn’t from all the others. Strange. It still amazes me how much trouble we all have with computers with pretty basic stuff like email, calendars, and addressbooks, and getting it all to sync. I hate crap like this, because it breaks the trust that I have in computers to do the simple stuff for me. But then if I can’t trust it, I don’t know, I might as well go back to pen and paper. Imagine how much time we could free up as a culture if we didn’t have to deal with Exchange, IMAP, ActiveSync, SyncServices, and all of that other crap that sounds nice but then fails in strange ways. My iPhone 4 has a broken lock button. This is really annoying, because I can’t just press a button to lock the phone. 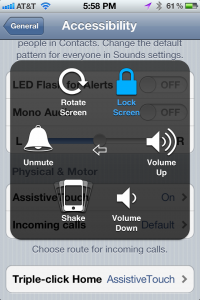 I found a workaround, which makes it possible (though still clumsy) to lock the phone. This adds a small circle area that you can tap on and then it brings up a little popup in which you hit “Device” and then “Lock Screen”. This is still clumsy because it requires multiple taps and also because that little circle is constantly in my way – you can drag it around, but there’s no area of the screen where it’s not annoying some of the time. I have “Triple-click Home” set to AssistiveTouch so I can do a triple click to toggle the dot, but it’s hard to get the device to recognize the triple tap and it tends to be very laggy. Honestly, it’s almost worse than having the dot there all the time. 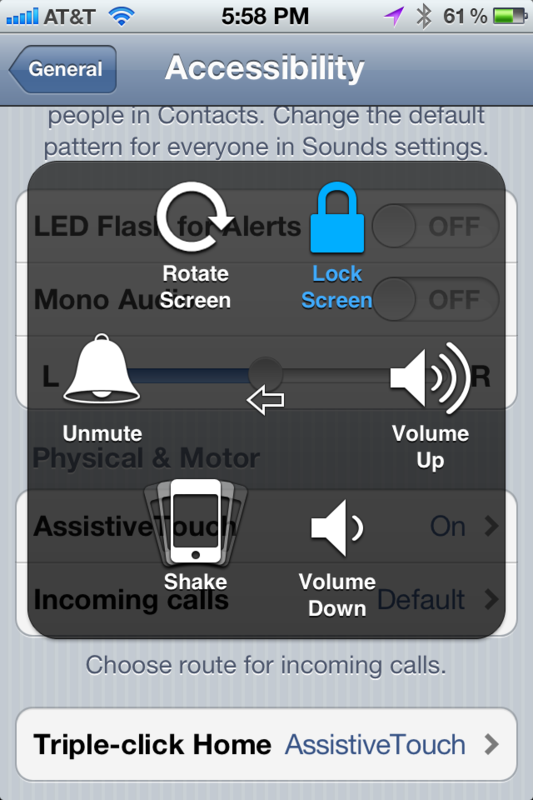 Hold down the Home button while tapping “Lock Screen”. There is some more info about the AssistiveTouch feature (including a video) at the Assistive Technology Blog.